Over 15 million American adults battled alcohol addiction in 2016, per the National Survey on Drug Use and Health (NSDUH). The National Council on Alcohol and Drug Dependence (NCADD) reports that one out of every 12 American adults struggles with alcohol abuse or dependence. Alcoholism is a pervasive and chronic disease that is treatable with specialized programs. One of the most popular forms of alcohol addiction management and recovery support is Alcoholics Anonymous (AA), a spiritual 12-Step program. AA has more than 2 million members worldwide in over 100,000 locally supported groups. It is a peer recovery and self-help program. AA is spiritual in nature and calls on its members to turn their lives over to a higher power. This concept of spirituality in healing may not work for everyone. AA also expects its members to remain abstinent from alcohol and drugs completely, and this is also a concept that is not ideal for every person. SMART Recovery: Smart Management and Recovery Training focuses on empowering the individual to sustain recovery. LifeRing: This secular group provides a healthy network of peers focused on remaining abstinent from drugs and alcohol. Women for Sobriety (WFS): This nonprofit, abstinence-based program is made up of women supporting each other in recovery. SOS. (Secular Organizations for Sobriety): This nonprofit network is made up of secular recovery-based groups. Moderation Management (MM): This program is not based on abstinence but instead on learning how to moderate and control problem drinking behaviors. The SMART Recovery program is not based on a spiritual foundation like AA is; instead, it’s foundation is research-based. This means that scientific research and evidence are used to support the techniques and methods that are promoted through this model. SMART Recovery programs offer both local in-person meetings and online support through a 24/7 chat board and daily online meetings. 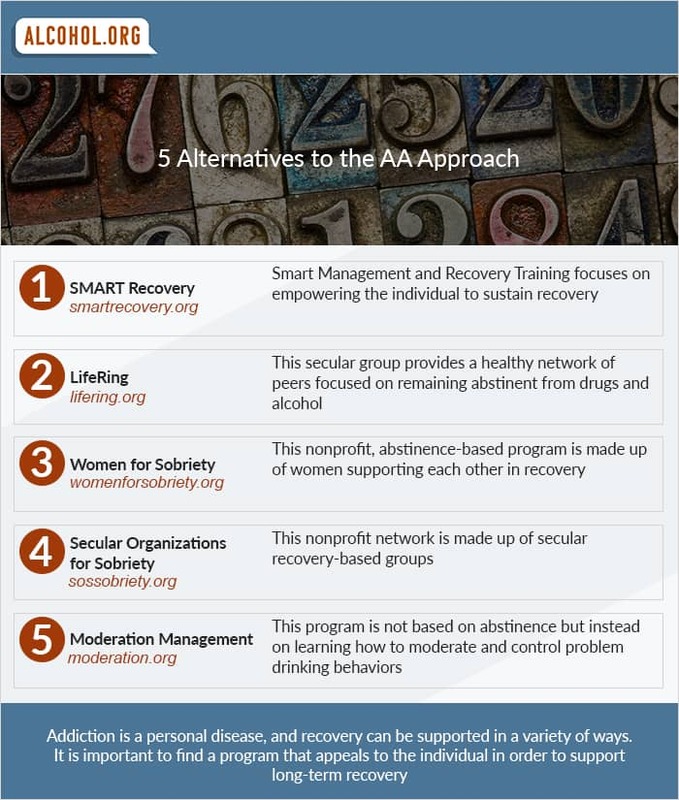 SMART Recovery programs avoid labels, such as "alcoholic" and shy away from the disease model of addiction. They focus on methods that use both Motivational Enhancement Therapy and Cognitive Behavioral Therapy components to engender change of self-destructive behaviors. SMART Recovery concepts help individuals to recognize that alcohol abuse can be destructive, and it creates problems emotionally, physically, socially, and behaviorally. Techniques aid in the exploration of maladaptive thoughts and unhealthy coping mechanisms, such as problematic drinking, and help to establish new and more balanced mechanisms of dealing with stress and managing difficult emotions. Unlike 12-Step programs, SMART Recovery respects that medications are often part of treatment and recovery for alcohol addiction, and supports the use of medications when deemed medically necessary. As new scientific methods are discovered and research evolves, so do the SMART Recovery protocols. Individuals learn how to be in charge of their own recovery and become self-empowered. Studies have shown that SMART Recovery methods can help to decrease problems related to drinking and increase the amount of days a person remains abstinent, the Journal of Internet Medical Research publishes. With a bustling online community and local meetings throughout the United States, LifeRing Secular Recovery is an alternative to traditional, spiritually based, 12-Step programs such as AA. LifeRing believes that each individual holds their own key to recovery, and it is not necessary to then place control in the hands of a spiritual being. As a secular self-help group, LifeRing meetings and doctrine encourage members to maintain abstinence from drugs and alcohol, and strive toward enhancing each person's "sober self" while weakening their "addict self." LifeRing concepts hold that everyone has a sober self inside them. The group works on developing techniques to enhance this version of self instead of the addict self who has previously been in control of all decisions and led to destruction in life. Each person is encouraged to find their own method of encouraging their sober self within a LifeRing program. Peer support is a big part of LifeRing recovery programs, as individuals share advice with other members, and offer support and encouragement in recovery. LifeRing focuses mainly on the present – on living a full and positive sober life without dwelling too much on past indiscretions and hurts that may have been the result of problematic drinking. Women for Sobriety (WFS) is a program that is specifically engineered to focus on women's treatment needs and what will best support their recovery. Face-to-face groups meet throughout the United States. The groups are led by moderators, and serve to promote emotional and spiritual growth free from the bounds of alcohol abuse and addiction. WFS uses 13 acceptance statements to support its "New Life" Program that asks members to focus their energies on positivity over negativity. Efforts are made to accept thoughts and actions as self-destructive, learn how to cope with the emotions and behaviors that are created through alcohol addiction, and then overcome them. Women are encouraged to go over the 13 acceptance statements each morning and then work through them throughout the day, reflecting on them each night. The 13 acceptance statements walk women through taking responsibility for the disease of alcohol addiction; they state that negative thoughts are destructive, happiness is a choice, the past is in the past, and love and acceptance are important tools for spiritual and emotional growth. Women also take responsibility for their own actions, understanding that each person is in control of their own happiness, and each woman is worthwhile and competent. WFS provides a gender-specific support system for encouragement and growth for women in recovery. Secular Organizations for Sobriety is not one specific program, but rather a collection of programs that are autonomous from each other. SOS provides individuals with alternatives to spirituality based recovery programs. SOS hosts both online and physical face-to-face meetings to help people overcoming any form of addiction, from behavioral addictions to drug and alcohol addictions. These programs offer support and encouragement for people who may wish for a different motivation or foundation than one based on spirituality and relinquishing control. Instead, individuals are encouraged to take on their own weaknesses, learn to accept them, and move forward in recovery. SOS-supported groups are nonprofessional, and offer a healthy network of individuals with the similar goal of sobriety. Moderation Management, or MM, is very different than many other recovery and support groups in that it doesn't require complete abstinence to be a member. Instead, MM focuses on helping people to manage problematic drinking and behaviors that are destructive, aiding in encouraging positive lifestyle changes. MM is a peer-support program that acknowledges that behaviors are changeable and that alcohol abuse (which differs from dependence) is a habit that can be altered. MM understands that there are varying degrees of alcohol abuse and not everyone suffers from the severity of addiction; however, most people can benefit from learning how to change behaviors related to drinking that are problematic. MM holds that problem drinking is not always the same thing as addiction, and in less severe instances, individuals may be able to moderate their drinking instead of abstaining completely. Moderation may not be the best strategy for everyone, MM acknowledges, but it may work well for some. An MM program will ask that its members take personal responsibility for their actions and problem drinking behaviors; understand that self-esteem and self-management are essential for recovery; recognize that people helping others is the backbone of the program; and offer respect and dignity to all members. The Moderation Management Steps of Change program works through nine steps in face-to-face meetings. The MM program and steps ask that members keep a diary of drinking patterns and behaviors, and detail all the issues that have been associated with drinking, both now and in the past. Individuals are then asked to go through 30-day period of abstinence where they stop drinking altogether. During that time, people are to develop coping mechanisms to avoid drinking when its warranted, to cut back on drinking, and to control drinking when they do engage in it. Rules about future moderate drinking should be made while abstinent, and individuals learn to recognize triggers for problematic drinking and how to manage them. Drinking should take a backseat to other habits and activities, and with Moderation Management, problem drinking can be minimized. Individuals may then decide to go back to drinking in moderation, or they may decide to remain abstinent beyond the 30 days. If there is a relapse, or slip of problematic drinking behaviors, after drinking resumes, then individuals participating in MM are encouraged to explore what happened, take steps to resolve the issues, and potentially establish new guidelines. Each individual in MM should establish their own personal goals for drinking or not drinking, as the case may be, and learn how to stay within these rules. Self-management and the elimination of behavioral and other issues associated with problem drinking are key components of the Moderation Management program. AA: What Is in the Big Book? AA: What Are the 12 Traditions?